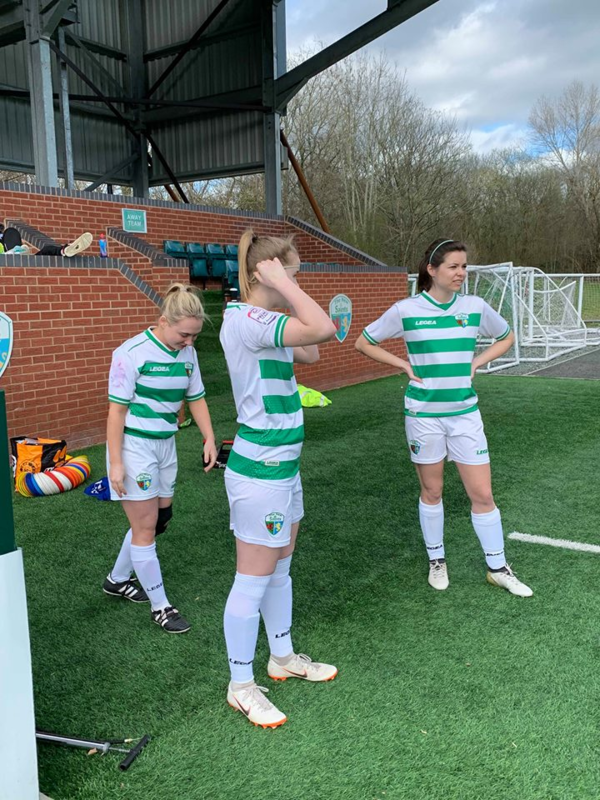 The New Saints Ladies set a new personal league victory record in their game against Steel City Wanderers, the previous being a 13-0 victory over the now defunct Wednesfield LFC, whilst competing in the West Midland Regional Women’s League. 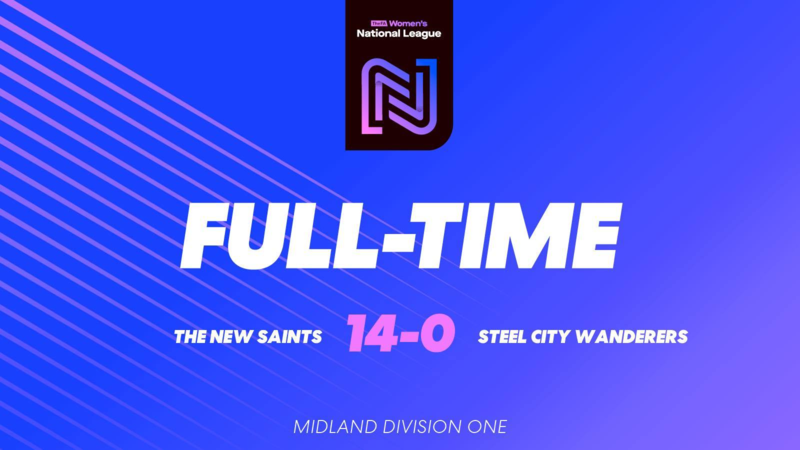 A 14-0 FA Women’s National League victory over the struggling Sheffield-based side gave the Saints all of the points with goals from: Lia Lewis (3), Emily Ridge (3), Zoe Griffiths (2), Kim Bebbington (2), Laura Pennington (2), Laura Morris and Erin Taylor. Manager, Lawrence Wilson, made changes to the side beaten by Wolves a few weeks ago, and following last weekend’s late cancellation by Solihull Moors, the squad was fresh and eager to get back out on the pitch and put right the result from the Wolves game. Saints started strongly moving the ball around freely with every one of the players getting early touches, including goalkeeper, Beth Cleveley. The opening goal came from such a passage of play and after a long string of passes, right winger, Zoe Griffiths stood a cross up to the back post for Kim Bebbington to head home on 6 minutes. A period of intense pressure ensued from TNS, with them having a number of shots but the fine form of the Steel City goalkeeper kept the score at 1-0. However, after the ball was picked up by centre back, Erin Taylor, just inside the Steel half, her pinpoint pass out wide to Griffiths found the winger with time to cross. This time her whipped cross was close to the goal and nestled into the far corner without a touch, as Griffiths scored her first and Saints their second. The Ladies had the ball in the back of the net two minutes later, Griffiths again crossed from the right, this time a little deeper, forcing her opposite winger Bebbington to collect, sending her own ball in to Pennington, who unselfishly set up Ridge for her first of the afternoon. Eight minutes later, Saints would have their fourth, as a free-flowing move found Bebbington in acres of space on the left, as her low driven cross was hit first time by the onrushing Ridge into the top right corner leaving the Steel City keeper stranded. Four minutes after that, Saints had their fifth as Ridge and Lewis played a neat interchange of passes, seeing the centre midfielder and captain for the day, find her shooting boots and score her first of the afternoon with a fierce low drive from 20 yards out. Pennington would finish the first half with a goal to add to her assist, as Lewis spread the ball wide to Griffiths, who again sent a wicked cross into the box. Ridge’s initial shot was saved, only for Pennington to pounce on the rebound and fire home. (Ridge (2), Bebbington, Griffiths, Lewis, Pennington). 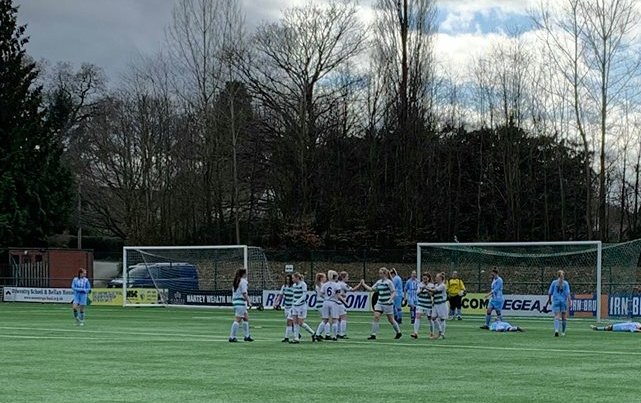 TNS Ladies began the second half in much the same way as they closed the first, however they had a new look to them, setting up in a 3-4-3 rather than their customary 4-2-3-1. This did not slow them down or cause a speedbump, however, with them scoring their seventh just two minutes after the restart. A ball back to the Steel City goalkeeper was pressed by Bebbington, who after beating the onrushing goalkeeper 25 yards from goal, rolled the ball into the empty net to bag her second of the afternoon. Two minutes later, Griffiths also scored her second, and Saints’ eighth, as a recycled corner was played back out wide to Pennington, whose low driven cross was turned in at the near post. Saints continued to have the lion’s share of possession, often seeing all ten outfield players camped inside the Steel City half. With substitutes beginning to warm up and the game appearing to need some fresh spark, Lewis hit the ninth of the contest. Lewis found space 30 yards from goal and taking a few touches to bring her closer, she hit a fierce driven shot into the top left corner to bag her brace. Wilson rang the changes in the 63rd minute, making all of his substitutions at once, Laura Morris (returning to action following a broken arm), Courtney Ashworth and Mia Beddows (making her debut since joining from AFC Telford United) entered the fray, replacing Taylor Davis, Kim Bebbington and Zoe Griffiths. On 69 minutes, Saints had their first hat-trick hero, as Ridge latched onto Lewis’ through ball and fired across the keeper first time to bag her third and Saints’ tenth. Six minutes later Morris had her first goal since returning from injury, as a low driven cross from the left by Ashworth found the substitute with acres of space, with the winger sending her first time shot into the bottom right. In the 84th minute, a short corner into Ridge was knocked down to Lewis who hit a fierce curling half-volley across the goalkeeper and into the far corner of the net to score her first ever TNS hat-trick and Saints’ twelfth of the game. It was unlucky thirteen for Steel City in the 86th minute as a ball into the box found Pennington in space who fired home underneath the goalkeeper. Erin Taylor bagged the final goal, with the young centre back stepping up and firing a low driven penalty into the bottom left after a foul just inside the Steel box. Taylor’s goal was her first for TNS and Saints’ fourteenth of the game. (Ridge x3, Lewis x3, Bebbington x2, Griffiths x2, Pennington x2, Morris, Taylor). 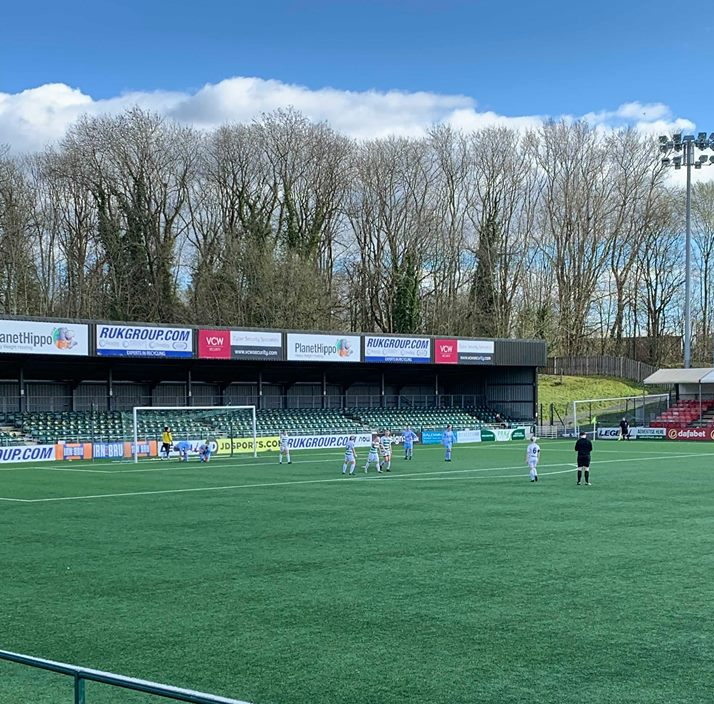 TNS Line-up: Cleveley, Davis (Beddows, 63’), Taylor, Smith, James, Lewis (C), Brown, Griffiths (Morris, 63’), Pennington, Bebbington (Ashworth, 63’), Ridge – Subs Not Used: Parkes, Doster. TNS Ladies is back in action on Mother’s Day, seeing them travel into Nottinghamshire to face Long Eaton United. Saints won the reverse fixture at Park Hall 4-3, thanks to a final minute screamer from Sarah Jackson, so they will be aiming to keep up with winning ways.